Part of the charm of a garden tower comes from its geometric lines and angles playing off the soft, natural forms of the plants around it. Each brings out the best in the others. 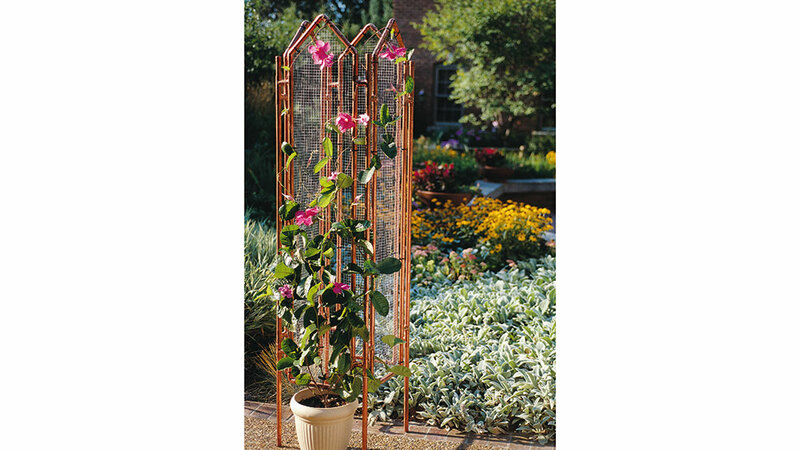 This elegant tower is a perfect complement to any climbing vine. The hardware cloth is sturdy enough to support twining branches or gripping tendrils. 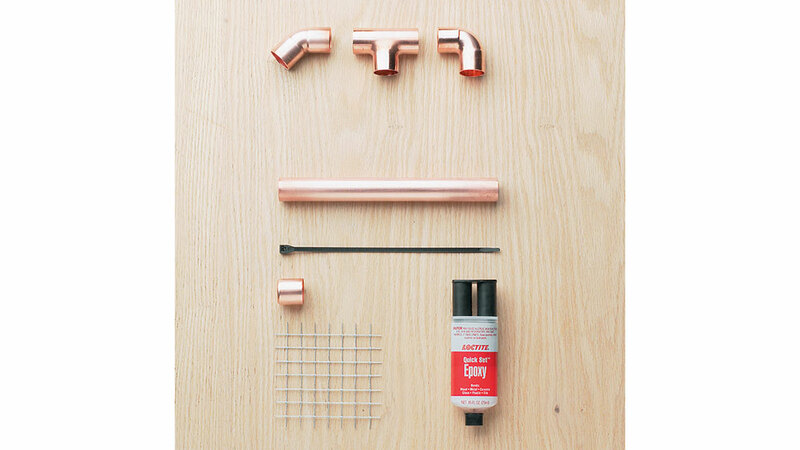 And the panels’ silver color contrasts with the copper pipes when the pipes are new and as they gain a warm patina. Best of all, you can build it yourself in a day from easy-to-find materials, at a fraction of the cost of a fancy tower from a garden boutique. You should be able to get all the materials in one stop at a home-improvement store. We’ll give you step-by-step directions, but to organize the project, think of the tower as four separate panels. Each panel shares two upright corner posts with its neighbors. Staggered T-connectors attach the panels to the posts. (We’ll talk more about this staggering in a bit.) First, we’ll build the four panels, then slip the four corner posts together. 1. Cut all the pipes to length. 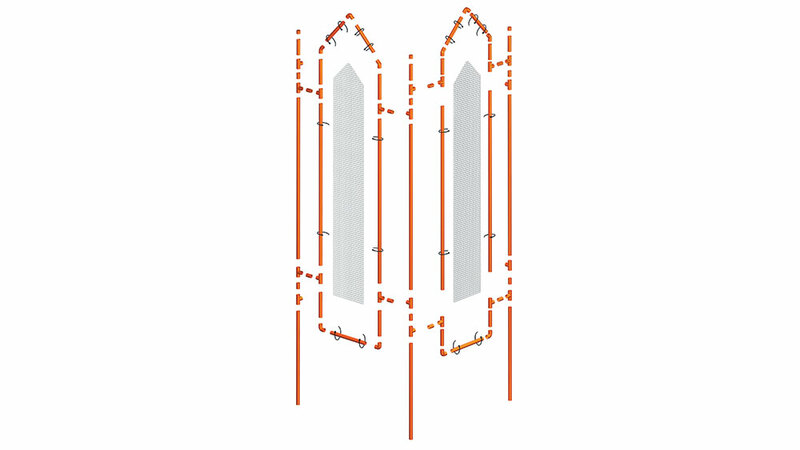 Use the “Pipe lengths cut list,” right, as your guide. 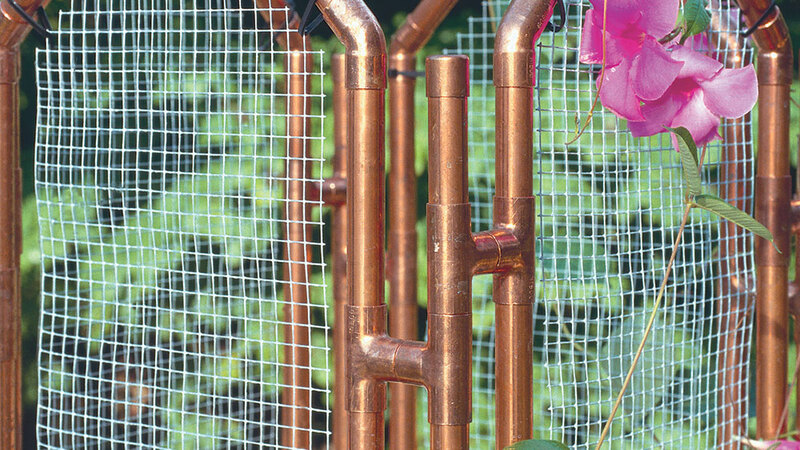 Measure carefully, because having the pipes just the right length is key to having the trellis fit together properly. Photo 2, below, shows how to use locking pliers for a firm hold. Cut the pipe with a pipe cutter instead of a hacksaw. This will prevent a possible distortion of the pipe’s shape. Lay the cut pipe and fittings out on the ground or a large, smooth work area. Since opposite panels are identical, build them at the same time. Notice in photo 3, below, that adjoining panels connect to their shared post at different spots. 3. Cut the hardware cloth. With side cutters, cut four strips of hardware cloth 10 inches wide and 59½ inches long, then cut the peaks as shown in the illustration below. As you see in photo 4, trim off the sharp ends of wires as you cut. That makes the strips easier to handle. 4. Hang the hardware cloth. Center the first one in its frame with black, ultraviolet-resistant plastic zip ties from the electrical section of the store. Position the zip ties on the panel frame as shown in the illustration and thread the ends through the edge of the mesh. Tighten the ties to pull the hardware cloth snug and snip off the “tails” of the zip ties. Then finish the other three panels the same way. 5. Attach corner posts to two panels. Build four identical upright corner posts. Position one corner post on each side of a panel. Slip one end of a 1¼-inch-long joint pipe into the T-connector on the panel and the other end into its corresponding T-connector on the corner post. Do the same for the identical opposite panel. Turn the two unattached T-connectors on each post so they’re in position to receive the joint pipes from the other two panels. Slip joint pipes into the open T-connectors on the corner posts. Now turn the tower over and attach the last panel to the open corner posts in the same way. Square all the connections up. For a finished look, attach caps to the tops of the four corner posts. Then go back and apply epoxy to all the joints and push them tightly together. When the epoxy has dried (read the directions to see how long it takes), set the tower in the garden. Sink the corner posts at least 10 to 12 inches into the ground to keep the tower rigid and give climbing plants a firm, solid support. 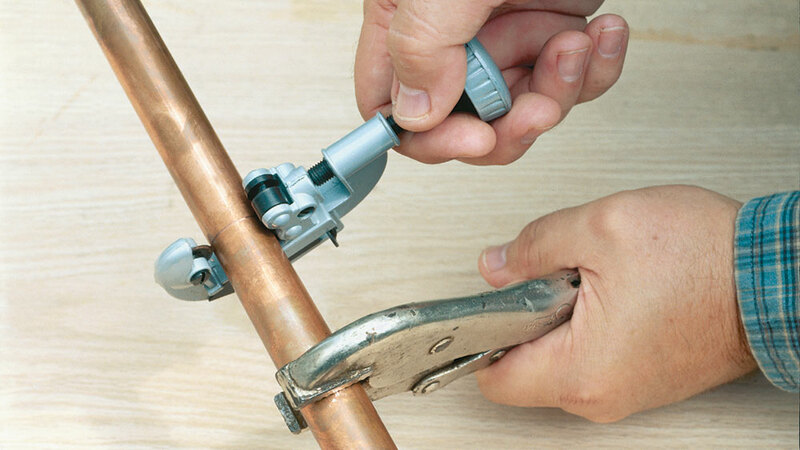 Use locking pliers (bottom) to hold pipes tightly when using a pipe cutter (top). Stagger the T-connectors to attach the panels to the four upright posts. 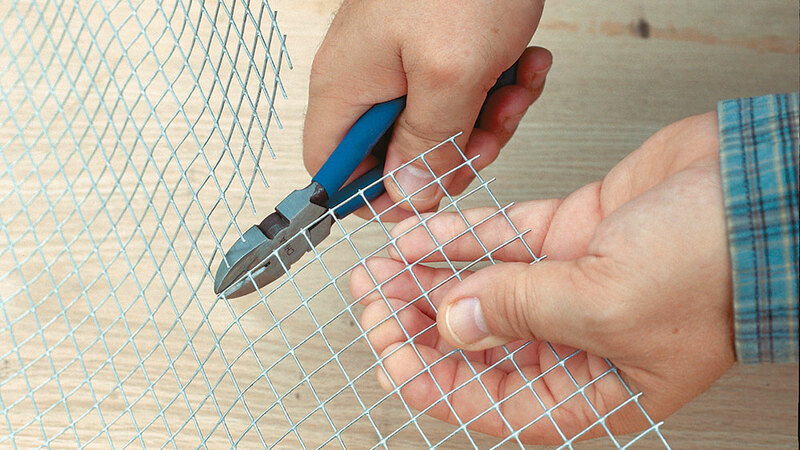 Trim off sharp ends as you cut the hardware cloth with side cutters. Tada! 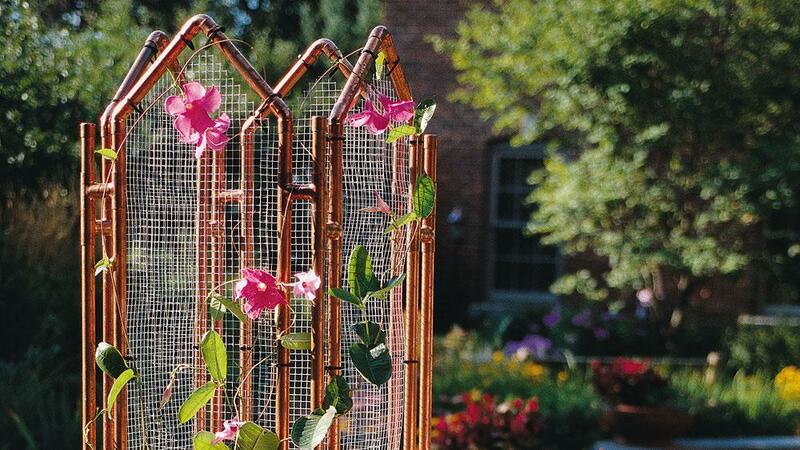 You have just created your very own copper garden tower. Now, go out there and enjoy your personalized cabin garden.